Hi everyone! Monique here with another Shadow Box. Last month I created a Haunted House Shadow Box and because I loved the shadow boxes so very much, so I decided to do another one. 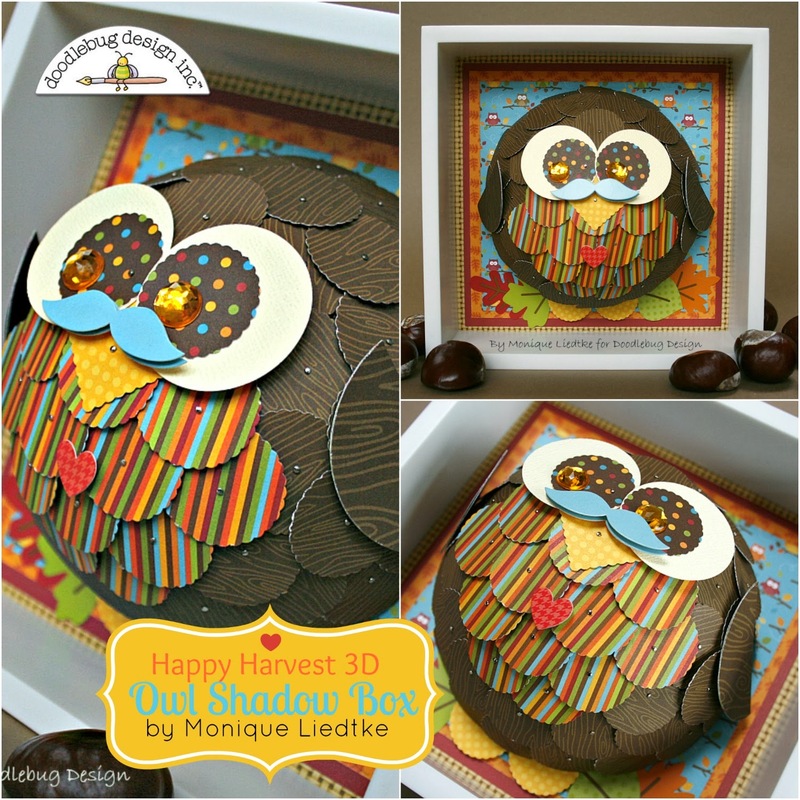 I used the Happy Harvest Collection which I love for its warm colors and awesome designs (the blue paper in the background with the owls is my favorite!). I used half of a styrofoam ball, painted it brown and covered it with punched 1 inch circles, which I adhered with lots of pins. I worked from the middle to the edge; so I started with the owl's eyes and tummy and then filled the rest of the body with brown circles. Last but not least I added some finishing touches like the moustache, the pupils in the eyes, the feet, and the wings and the little heart. 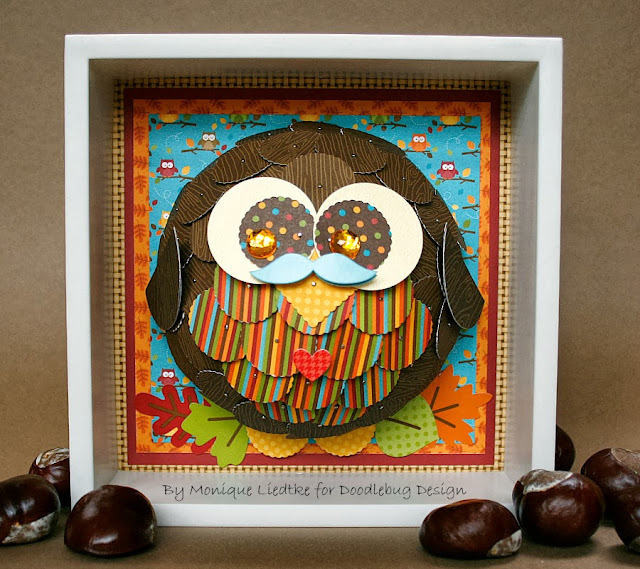 I had so much fun creating the owl and the fun part is, there're so many other animals you can create with half a styrofoam ball and punched circles, like a cute prickly hedgehog or a green frog or a fat chicken ... ! The possibilities are endless! If you decided to try one too, I'd love to see them! 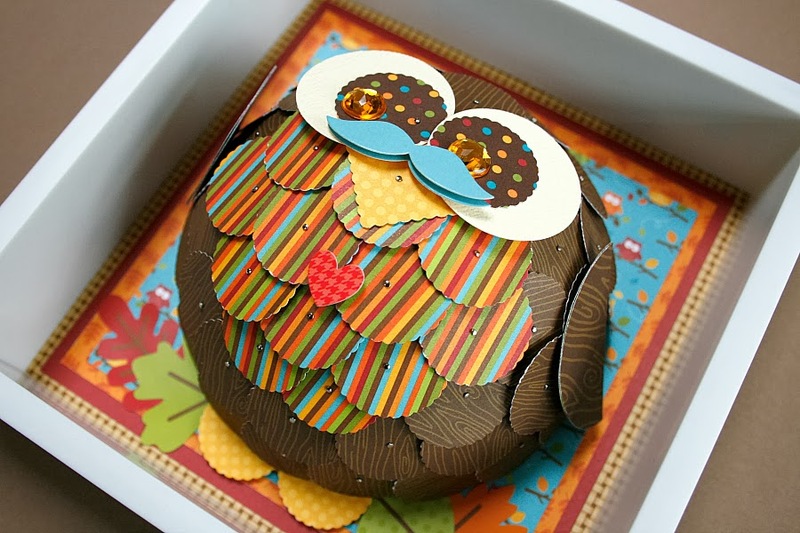 Thanks for visiting Doodlebug's blog and I wish you happy crafting! Monique, this is fab!!! So cute! I love this, I Want one! Awwwww, super cute and what a fab way to dress up a gift box! This is so cute and clever, Monique! Fabulous project! I love the 3D effect and the colors! Absolutely adorable!!! You are very creative! Thanks ladies, for all your lovely comments!! They made my day :) !! 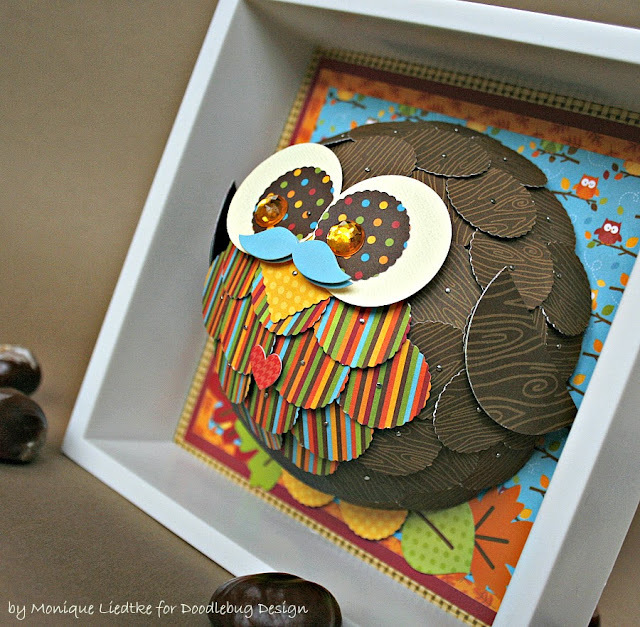 Hi, I really like the Owl shadow box ya done!! I like making shadow box. Thank you for sharing some of your creative.